One of the biggest issues with collaborative work is sitting around twiddling your thumbs while waiting for someone else to get their work done. 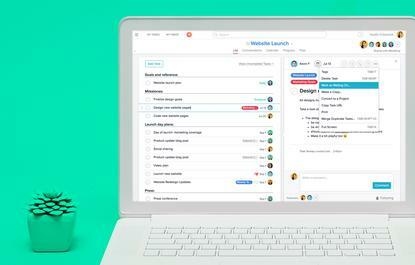 Asana announced a new feature on Thursday that's aimed at cutting down on emails asking when a particular task will be finished. Users of the collaboration and tracking software will be able to mark that a task they're assigned to is waiting for someone else to complete their work, using the new Dependencies feature. That way, for example, a designer can say her final layout of a web page is waiting on a marketer to put the finishing touches on the copy and on images that are supposed to be included. The new feature is part of the company's push to be more relevant and useful to a broader number of organizations, according to Asana co-founder and CEO Justin Rosenstein. This feature is aimed at helping Asana better fit into businesses and other organizations with complex processes. When users say they're waiting for another piece of the work to be completed, a banner will show up on the task they're working on. Once all of the blocks on their progress have been cleared, they will be notified that they're ready to go. Asana already somewhat supported this through the ability to follow the progress of other users' tasks. However, that feature notified users of all activity on a particular task, including comments, due date changes, and more. Dependencies is a feature that's designed more for people who just want to know when a step in a project is completed. Asana's access controls will make sure that people who have private projects will be able to mark dependencies for public projects without those notifications showing up places that they shouldn't, Rosenstein said. In other words, a team can track the progress of tasks that are holding up a secret project without informing the whole company that a secret project exists. The news comes three months after Asana announced it had raised a US$50 million round of venture capital funding. At that time, the company reported it had 13,000 customers, including Duolingo, Khan Academy, and Simplehuman.